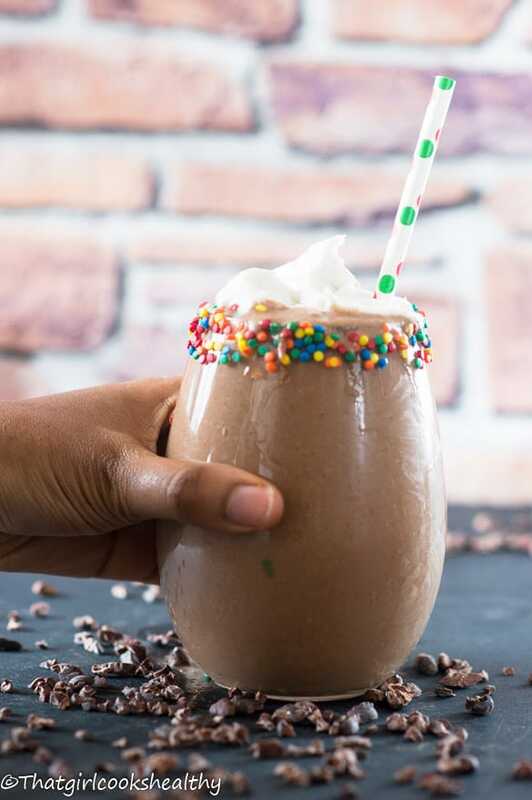 Healthy chocolate smoothie recipe – get the best of the Caribbean sunshine with this vegan smoothie made with cacao powder, banana, coconut milk and nutmeg. This smoothie is the true essence of Caribbean flare, if I had to choose a few quintessential spices that you will find in Caribbean cuisines (namely the English and French speaking islands) I would highly recommend having some nutmeg, cinnamon, mixed spice, mace and pimento (allspice) in your pantry. Of course the Caribbean compromises of other spices BUT when it comes to adding some flavour to some porridge like this cornmeal porridge or even some peanut punch, you are guaranteed to find at least one of the aforementioned spice(s) as a key ingredient. I forgot to mention hot beverages, yes we add spices to hot chocolate or cocoa tea as Jamaicans like to call it. Each island has there own variation, some being more concentrated with nutmeg and others like an equal balance of spices. Nevertheless the results are always flavoursome, trust me I’ve tasted hot chocolate from a number of islands and I cannot decide who makes it the best. 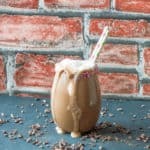 This smoothie is like the little sister to Caribbean hot chocolate as I know it, if you’re a fan of warming notes like nutmeg then this one is for you. 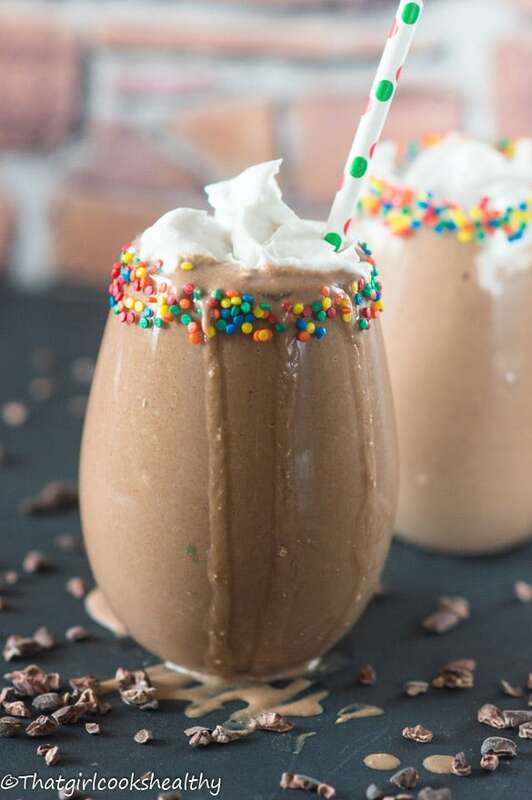 I haven’t seen any chocolate nutmeg smoothies in cyberspace, so let me be the first to tap into my culinary island roots while providing you with the blueprint to an awesome smoothie. The great thing about this smoothie it’s all natural and free from any additives or preservatives. This makes it a much healthier alternative to the store brought kind. I would even render it a vegan chocolate smoothie with immune boosting properties. Nutmeg is quite pungent, you really don’t need a great deal to pack a punch. I used a total of 1/2 tsp which really gave this drink a kick without being too overwhelming in taste. The spice really compliments the other ingredients – coconut milk, chia seeds, almond butter, medjool dates and raw cacao powder. Totally vegan and paleo approved recipe and most importantly NO GLUTEN…YIPEE! You don’t have to be afflicted with dietary restrictions in order to enjoy this beverage. It’s so tasty and suitable for everyone, children too…. 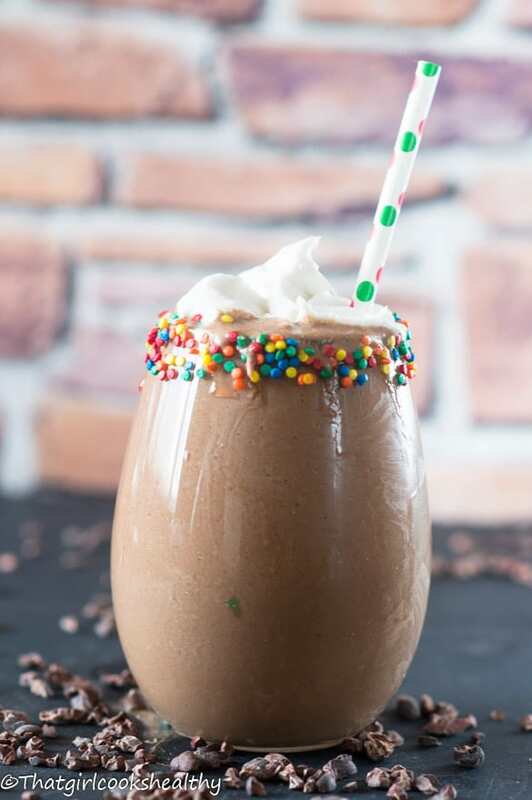 Best of all chocolate smoothies are rich, decadent, dark and just darn right delicious!! If you want to convert this smoothie into a protein powerhouse then I suggest adding 2 scoops of your favourite protein powder. Why not adding avocado to the mix and dose up on some omega fats. Alternatively, you can trade in the banana for the avocado and yield a nice thick consistency. Not a fan of coconut milk? No problem! Simply use almond milk instead. Add all of the ingredients to a blender and blitz into a smooth consistency. Hi Jan, Yes you’re right, I was tied with what to categorise this as – smoothie vs dessert. In any case you can serve as you wish and I hope you like it. Funny! 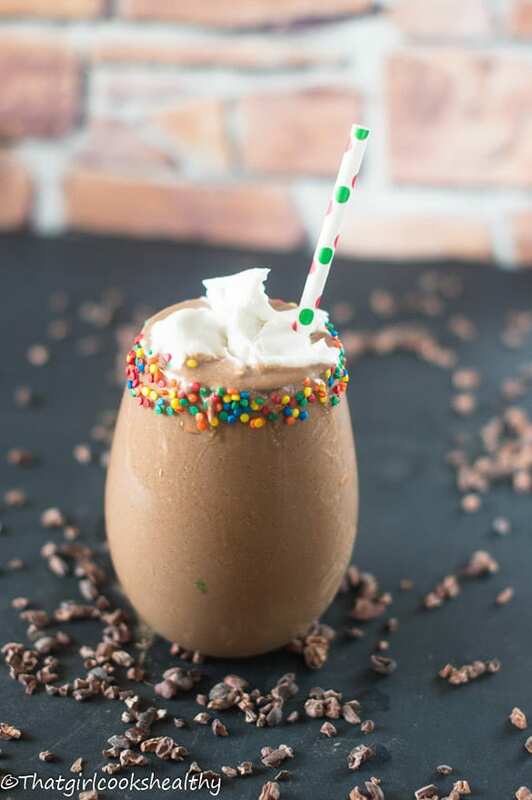 We can settle this as a dessert smoothie. Thank you for commenting. 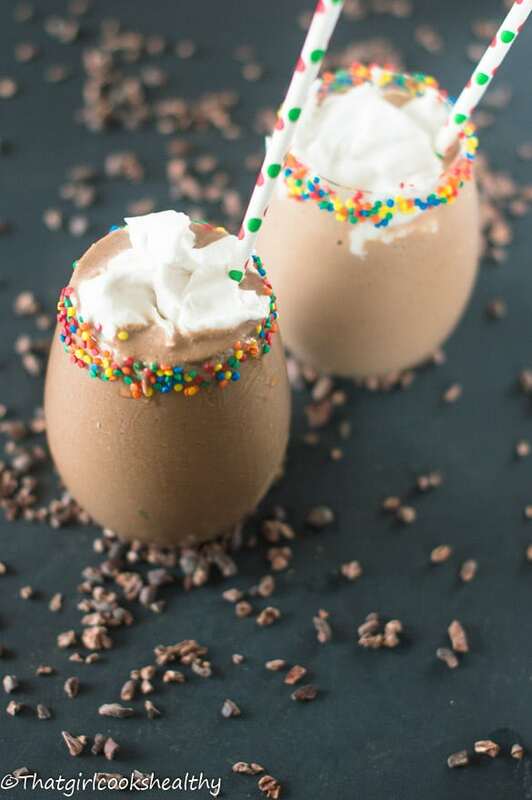 This looks like a decadent ice cream float! I can’t believe it’s vegan, gluten-free, and paleo! Love the combo of chocolate and nutmeg. Yum! One side of my family is from the Caribbean and we just took a vacation to visit them in Martinique recently. I loved all the spices they used in their cooking — completely addicted to boudin noir, accras de morue, and their holiday ham — infused with spices and that special piment pepper that we can’t get in the states. 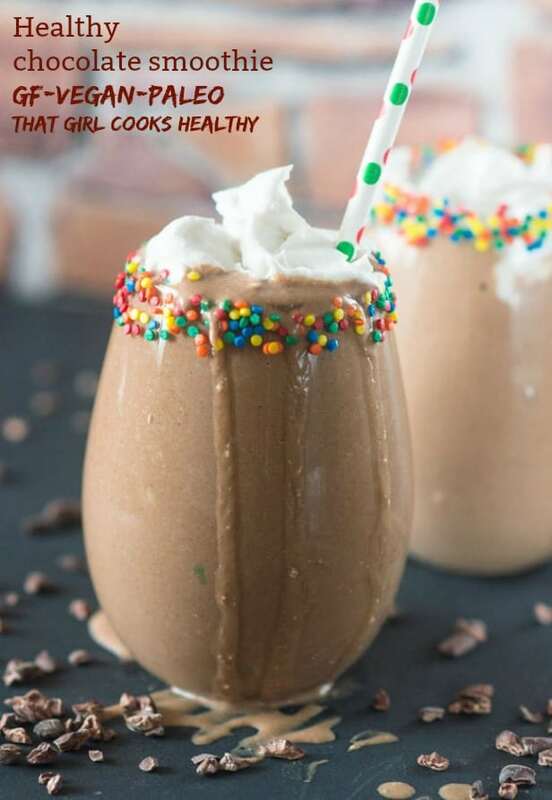 This smoothie looks healthy and delicious! Hi Lisa, Oh wow! You have family from the beautiful island of Martinique? Amazing! That is one island I haven’t travelled to YET. I need to introduce some of their recipes onto the blog when I get the chance to. I can imagine how in awe you were of those wonderful cuisines. I’m literally drooling, I am such a huge nutmeg lover, I’m going to have to try this today! Thank you Sue, I’m sure you will enjoy this smoothie. Yes, you definitely will Jo. I just bought some nutmeg today. As soon as I find a grater, I’m going to try this recipe. Thanks for the support. Yes I promise you will LOVE this smoothie. I am definitely going to make this delicious smoothie! I saw your recipe for green banana porridge this weekend but couldn’t make your vegan version because I didn’t have coconut milk on hand. I remember my mother making it but never actually tried to make it until I was diagnosed with pre-diabetes. After doing some research I found that the green banana is a resistant starch so I gave up my cornmeal porridge for green banana porridge. Wish me luck! I hope you enjoy the smoothie Jennifer. Most of my recipes use low GI index ingredients or contain produce that won’t impact glucose so I hope you find my recipes useful to your existing lifestyle.